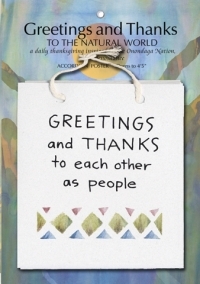 In eleven hand-lettered and watercolor-illustrated panels, Greetings and Thanks honors the universal message of gratitude and thanksgiving. It is long and narrow when hung on your wall (it comes with hanging string!) or small and handy for prayers and meditations when kept on your night stand, altar, or near your dining table. Inspired by the Thanksgiving Address of the Haudenosaunee, an oral tradition used at gatherings. Poster printed on 100% postconsumer waste stock, dioxin free, not chlorine bleached. Biodegradable cellophane package.